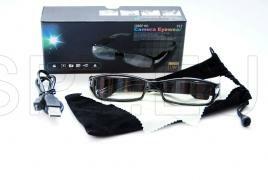 These glasses have builtin hidden camera which records in fullHD quality. The audio-video recording is in AVI file format in resolution 1920x1080. 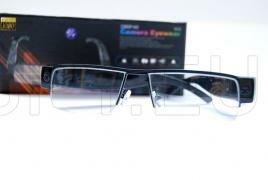 The glasses also have built-in memory and a microSD card slot. You can use memory cards with a maximum capacity of 32GB. The camera control is very easy and seamless. Pushing a single button can turn the camera on or off, with the same button you start and stop video recording. The device has a rechargeable battery that allows continuous recording for about an hour. With these glasses you can take several actions. You can record audio-video files in HD resolution 1920x1080 or take photos with resolution 2560x1920. With the software motion detector you can to record only when there is motion in front of the camera lens, thus saving battery. The glasses have a microSD card slot and after inserting one you can use it as a removable disk. The built-in rechargeable lithium-ion battery provides about an hour - hour and a half continuous uptime. With this hidden camera, you can record audio or video files or only take pictures. The video is in AVI format in 1280x720 resolution at 30 frames per second. The pictures are in JPEG with 4032x3024 pixels. 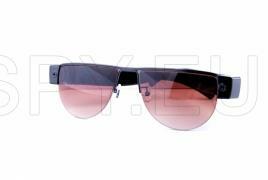 The glasses have a microSD card slot in which you can insert up to 32 GB card.